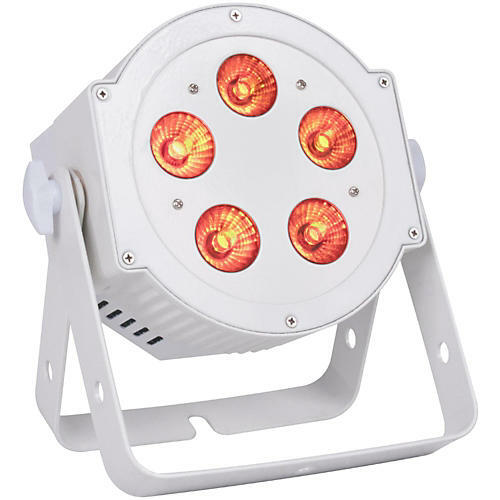 5P HEX Pearl’s professional features include: 4 DMX modes (6, 7, 8, & 12 channel), 5 operational modes, 5 dimming curves, flicker free operation and a 4-Button DMX menu with digital display. Daisy-chain up to 8 units together via the fixtures built-in IEC In/Out power connectors. The 5P HEX Pearl is compatible with the Dotz Par RF, easy-to-use, wireless RF remote (Sold Separately). Alternatively the fixture may be operated via a DMX controller or the units built-in programs.